Like R1 and R2 before it, R3 checks the FCS in the data-link trailer, looks at the type field to decide whether the packet inside the frame is an IP packet, and then discards the Frame Relay header and trailer. The routing table entry for 150.150.4.0 shows that the outgoing interface is R3's Ethernet interface, but there is no next-hop router because R3 is connected directly to subnet 150.150.4.0. All R3 has to do is encapsulate the packet inside a Ethernet header and trailer, and forward the frame. Before R3 can finish building the Ethernet header, an IP ARP broadcast must be used to find PC2's MAC address (assuming that R3 doesn't already have that information in its IP ARP cache). 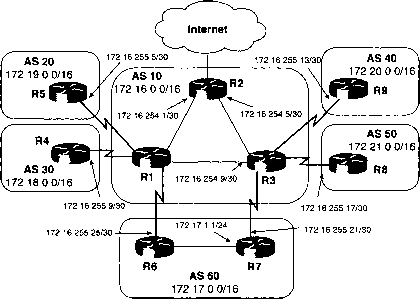 The routing process relies on the rules relating to IP addressing. For instance, why did 150.150.1.10 (PC1) assume that 150.150.4.10 (PC2) was not on the same Ethernet? Well, because 150.150.4.0, PC2's subnet, is different than 150.150.1.0, which is PC1's subnet. Because IP addresses in different subnets must be separated by some router, PC1 needed to send the packet to some router—and it did. Similarly, all three routers list a route to subnet 150.150.4.0, which, in this example, includes IP addresses 150.150.4.1 to 150.150.4.254. What if someone tried to put PC2 somewhere else in the network, but still using 150.150.4.10? The routers then would forward packets to the wrong place. So, Layer 3 routing relies on the structure of Layer 3 addressing to route more efficiently.